Curtis Sittenfeld has established a reputation as a sharp chronicler of the modern age who humanizes her subjects even as she skewers them. Now, with this first collection of short fiction, her “astonishing gift for creating characters that take up residence in readers’ heads” (The Washington Post) is showcased like never before. 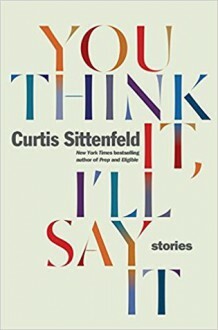 Throughout the ten stories in 'You Think It, I’ll Say It', Sittenfeld upends assumptions about class, relationships, and gender roles in a nation that feels both adrift and viscerally divided. With moving insight and uncanny precision, Curtis Sittenfeld pinpoints the questionable decisions, missed connections, and sometimes extraordinary coincidences that make up a life. Indeed, she writes what we’re all thinking — if only we could express it with the wit of a master satirist, the storytelling gifts of an old-fashioned raconteur, and the vision of an American original.